Diagnostic Features - Similar to Odontomachus but with the apical mandibular armament with the dorsalmost tooth acute and the petiolar node not ending dorsally in a spine. See Brown (1978c). Anochetus Mayr (1861: 53; type species Odontomachus ghiliani Spinola, 1851b: 55, type location Morocco, by monotypy); junior synonym Stenomyrmex Mayr (1862: 711; type species Myrmecia emarginata, by subsequent designation of Wheeler (1911f: 173; type location Central America); synonymy by Brown (1978c: 552). Mayr's (1861) genus description is at . 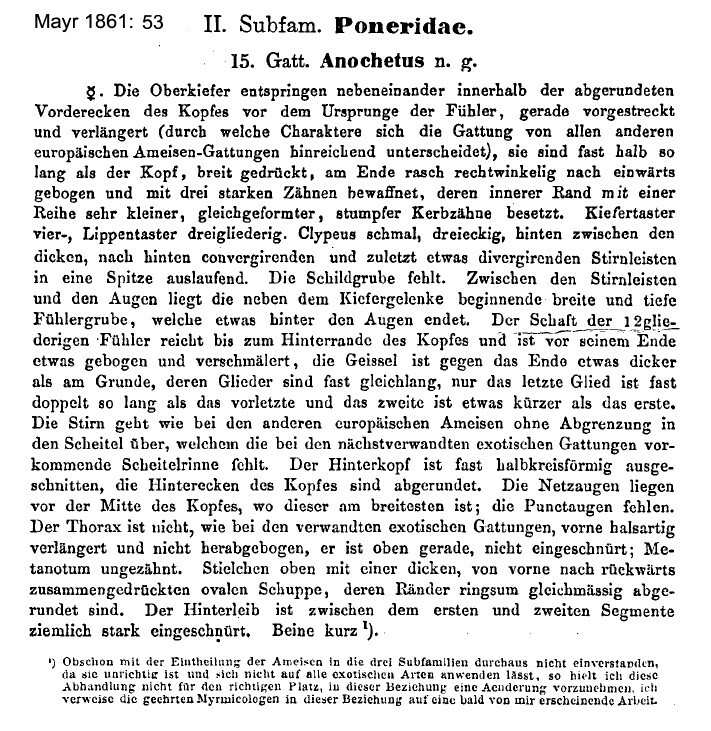 See Mayr's (1865) descriptions at and his (1896) definiton of the male at . Brown (1978c) revised the genus and I have followed his synonymies and so-on. The revision is poor on descriptions, etc., and leaves much to be desired. For instance, one gets the impression that he paid little attention to the work of Bernard (1952). What little is known of their general biology was summarised by Brown (1978c). The colony size is of the order of 100 individuals, usually in cryptic sites - rotten or hollow twigs, under bark, etc. Some including pellucidus and fulginosus apparently are more or less arboreal. Most forage after dark, often widely, and all certainly are predaceous. If attacked their general response is to feign death. Probably all are predaceous, utilising a trap-jaw mechanism to seize prey and to "jump" backwards. Brown (1976) regarded the genus as most likely having its origin in the Old World wet tropics, with arid-country species restricted to that global area. Egypt records - none - but overall geographic distribution suggests that Anochetus sedilloti Emery and Anochetus traegaordhi Mayr are likely to be present.